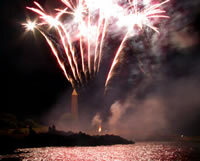 Click here to view the 2009 event calendar! 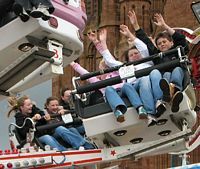 The Largs Viking Festival takes place every August/September in Largs, to commemorate the 1263 Battle of Largs when the Vikings were defeated for the final time on the shore of Largs. In recent years the festival featured the opening parade and ceremony, with various events such as the ABBA tribute Voulez Vous throughout the week, the second annual Viking Festival Skate Competition (see sport and leisure section for results and photos), the annual viking village giving visitors the chance to get up close to vikings and learn from them, the fun fair and of course the spectacular Party at the Pencil burning of the longship, battle re-enactment and closing fireworks. Scottish Rockettes on the opening day. 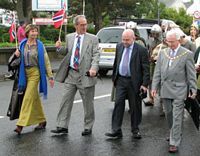 The dignatries of Poland and Norway in the Parade, with Provost Drew Duncan. RBLS Pipe Band lead the parade. The Rotisserie at the market. Fine French products at the market. A large range of cheeses from the continent. Enjoying the delights for sale at the authentic market. The sun sets on the eve of the Viking funeral. The promenade illuminated by the fair. The 'body' is taken to Aubery for the funeral. Vikings in the funeral procession. The town of Largs has never been this busy ! Vikings show youngsters their culinary skills. Making jewellery in the village. A Viking family enjoy lunch. Alexandra, from Poland, sells her wears. Lauren McVittie enjoys the fun fair ! The spectacular Party at the Pencil ! Visit the official festival website by clicking here. Some of the photographs used in this section have been used courtesy of Ian Dalgleish, please visit his excellent Largs website.